The Hove Prom 10k is now a fading memory, but I shall write up the Lewes Downland Ten Mile before I forget it. I last ran this race in 2011, and before that in 2009. I really should run it more often, in spite of the somewhat fearsome elevation. It was a beautiful day, still, sunny, but with a slight cool edge to the air, very welcome on such a demanding course. The race is always well supported, not least by runners from Lewes’s twin town in France, Blois, who visit every year. I tried out my A level (1973) French on them, but to little effect. A five mile race starts first, then we were sent off, while a flock of sheep stampeded around the field. The first three miles are a steady ascent to Blackcap and beyond, on tracks I used to know well in my days of lunchtime runs from my base at Sussex University. Just after the three mile mark we descended, a fast stretch, and, for the first time I found my rhythm. But after a mile, there’s a fierce climb again, and then the route goes eastwards, along paths too narrow for comfortable running. At around six miles, we descend into a wooded area, muddy in the extreme if it’s rained, but this autumn has been dry. Then there’s a fearsome climb to water, and the final two and half miles. I finished in 1:57:44. 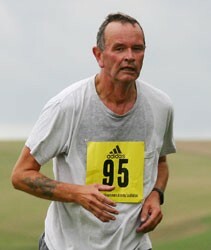 By comparison, in 2009 I managed 1:47:49, while in 2011 I was slower, at 2:00:03. I can improve, even at my age.